A protocol for ultrasonic fatigue testing in the high and ultra-high cycle region in axial tension-compression loading mode. Trško, L., Nový, F., Bokůvka, O., Jambor, M. Ultrasonic Fatigue Testing in the Tension-Compression Mode. J. Vis. Exp. (133), e57007, doi:10.3791/57007 (2018). Ultrasonic fatigue testing is one of a few methods which allow investigating fatigue properties in the ultra-high cycle region. The method is based on exposing the specimen to longitudinal vibrations on its resonance frequency close to 20 kHz. With use of this method, it is possible to significantly decrease the time required for the test, when compared to conventional testing devices usually working at frequencies under 200 Hz. It is also used to simulate loading of material during operation in high speed conditions, such as those experienced by components of jet engines or car turbo pumps. It is necessary to operate only in the high and ultra-high cycle region, due to the possibility of extremely high deformation rates, which can have a significant influence on the test results. Specimen shape and dimensions have to be carefully selected and calculated to fulfill the resonance condition of the ultrasonic system; thus, it is not possible to test the full components or specimens of arbitrary shape. Before each test, it is necessary to harmonize the specimen with the frequency of the ultrasonic system to compensate for deviations of the real shape from the ideal one. It is not possible to run a test until a total fracture of the specimen, since the test is automatically terminated after initiation and propagation of the crack to a certain length, when the stiffness of the system changes enough to shift the system out of the resonance frequency. This manuscript describes the process of evaluation of materials' fatigue properties at high-frequency ultrasonic fatigue loading with use of mechanical resonance at a frequency close to 20 kHz. The protocol includes a detailed description of all steps required for a correct test, including specimen design, stress calculation, harmonizing with the resonance frequency, performing the test, and final static fracture. Fatigue damage of structural materials is strongly connected with industrialization and mainly with use of steam engine and steam locomotives for railway transport, where a lot of metal components, mainly iron based, have been used and had to withstand various types of cyclic loading. One of the earliest tests was done by Albert (Germany 1829)1 on welded chains for mine hoists. The loading frequency was 10 bends per minute, and the maximal tests recorded reached 100,000 loading cycles1. Another important work was carried out by William Fairbairn in 1864. Tests were performed on wrought-iron girders with use of a static load, which was lifted by a lever and then dropped causing vibrations. The girder was loaded with gradually increasing loading stress amplitude. After reaching several hundred thousand cycles on various loading stress amplitudes, in the end the girder failed after just about five thousand loading cycles at a loading amplitude of two fifths of the ultimate tensile strength. The first comprehensive and systematic study of the influence of repeated stress on structural materials was done by August Wöhler in 1860-18701. For these tests, he was using torsion, bending, and axial loading modes. Wöhler designed many unique fatigue testing machines, but their disadvantage was low operation speeds, for example the fastest rotating bending machine operated at 72 rpm (1.2 Hz), thus completion of the experimental program took 12 years1. After performing these tests, it was considered that after reaching a loading amplitude at which the material withstands 107 cycles, the fatigue degradation is negligible and the material can withstand an infinite number of loading cycles. This loading amplitude was named the "fatigue limit" and became the main parameter in industrial design for many years2,3. Further development of new industrial machines, which required higher efficiency and cost savings, had to provide the possibility of higher loading, higher operation speeds, higher durations, and high reliability with low maintenance requirements. For example, components of the high-speed train Shinkanzen, after 10 years of operation, have to withstand approximately 109 cycles and failure of a main component can have fatal consequences4. Furthermore, components of jet engines often operate at 12,000 rpm, and components of turbo blowers often exceed 17,000 rpm. Those high operation speeds increased requirements for fatigue life testing in the so-called ultra-high cycle region, and to assess if the fatigue strength of a material could be really considered constant for more than 10 million cycles. After the first tests performed by exceeding this endurance, it was obvious that fatigue failures can occur even at applied stress amplitudes lower than the fatigue limit, after a number of cycles much more than 107, and that the damage and failure mechanism could be different from the usual ones5. Creating a fatigue test program aimed at investigating the ultra-high cycle region required the development of new testing devices to strongly increase the loading frequency. A symposium focused on this topic was held in Paris in June 1998, where experimental results were presented which were obtained by Stanzl-Tschegg6 and Bathias7 at 20 kHz loading frequencies, by Ritchie8 with the use of 1 kHz closed loop servo-hydraulic testing machine, and by Davidson8 with a 1.5 kHz magneto-strictive testing machine4. From that time, many solutions were proposed, but still the most commonly used machine for this kind of test is based on the concept of Manson from 1950 and uses frequencies close to 20 kHz9. These machines exhibit a good balance between strain rate, the determination accuracy of the number of cycles, and the time of the fatigue test (1010 cycles are achieved in approximately 6 days). Other devices were able to provide even higher loading frequencies, like the one used by Girald in 1959 - 92 kHz and Kikukawa in 1965 - 199 kHz; however, these are rarely used because they create extremely high deformation rates and, since the test lasts for only few minutes, a remarkable error in the cycle counting is expected. Another important factor limiting the loading frequency of resonance devices for fatigue testing is the size of the specimen, which is in direct relation with the resonance frequency. The larger the requested loading frequency, the smaller the specimen. This is the reason why frequencies above 40 kHz are rarely used10. Since the displacement amplitude is usually limited within the interval between 3 and 80 µm, ultrasonic fatigue testing can be successfully applied on most metallic materials, though techniques for the testing of polymeric materials such as PMMA11 and composites12 were also developed. Generally, ultrasonic fatigue testing is possible to perform in modes of axial loading: tensile - compression symmetrical cycle13,14, tension - tension cycle15, three-point bending15, and there are also a few studies with special modifications of the system for torsion testing15,16 and biaxial bending17. It is not possible to use arbitrary specimens, because for this method, the geometry is strictly related to achieving the resonance frequency of 20 kHz. For the axial loading, several types of specimens have been commonly used, usually with an hour-glass shape with a gauge length diameter from 3 to 5 mm. For the three-point bending, thin sheets are commonly used, and for other methods special types of specimens are designed, according to the method type and testing conditions. The method was designed for evaluation of fatigue life in the high and ultra-high cycle region, and this means that at 20 kHz loading, a million cycles is obtained in 50 s; therefore, this is usually considered the bottom limit of loading cycles which can be investigated with reasonable accuracy, with respect to the number of cycle determination. Each specimen has to be harmonized with the ultrasonic horn by changing the specimen's mass to provide the right resonance frequency of the system: ultrasonic horn with specimen. Note: Each specimen's geometry has to be selected and calculated according to the mechanical and physical properties of the tested material, so that it has an identical resonance frequency as the ultrasonic testing system. Note: The standard "hourglass" tension-compression specimen geometry, with defined main dimensions, is shown in Figure 1. Dimensions d, D, and r are user defined (independent), while l and L dimensions have to be calculated, according to the conditions of the correct resonance frequency (dependent). The gauge length l results only from the geometry ratio between d, r, and D, and can be calculated easily or obtained from a component model; thus, it will not be an object of further discussion. Note: The main dimensions of the specimen (d, D, r) are chosen according to the material parameters and the test conditions. Determine the gauge diameter d according to the required volume of material for testing. In the case of a homogenous microstructure with no internal defects, a smaller gauge diameter is preferred. In the case of a material with significant internal defects (such as voids and shrinkages in cast materials), a bigger gauge diameter is necessary. The gauge diameter d is usually from 3 mm to 5 mm. Determine the head diameter D according to available experimental material size. The used head diameter D is usually from 10 mm to 15 mm. Note: The larger the D is, the shorter the head length (L) will be. Determine the gauge radius r according to the required mechanical stress distribution in the specimen's gauge length. The larger the gauge diameter r is, the smoother is the mechanical stress distribution. A commonly used gauge radius is r = 20 mm or r = 32 mm. Note: The larger the r is, the longer the specimen will be. Note: Here the fr is the resonance frequency of the ultrasonic system (Hz), ρ is the volume density (kg m-3), and Ed is the dynamic modulus of elasticity (kg m-3). Note: Here l is the gauge length (m), D is the head diameter (m), and d is the gauge diameter (m) (Figure 1). Note: Here A is the hyperbolic approximation (m-1) determined by equation (2), and K is the wave number (-) determined according to expression (1). Note: Here K is the wave number (-) determined according to expression (1) in point 1.2.1, β is the effective eccentricity (m-1) determined by equation (3), and l is the gauge length (m) (Figure 1). Note: Here is the geometrical factor (-) and u is the required displacement amplitude of the free end of the specimen (m). Note: Here ɛ is the deformation amplitude (-) determined according to expression (5), and Ed is the dynamic modulus of elasticity (kg m-3). If the calculated mechanical stress is too low, it is necessary to increase the displacement amplitude u (m), and vice versa. Due to various small deviations of the machined specimens from an ideal shape, manufacture specimens with longer heads, usually L + 0.5 mm. Note: Harmonizing is the process of compensating various small deviations of the real specimen from the ideal, calculated shape, to obtain the correct resonance frequency, which is in harmony with the ultrasonic acoustic sonotrode. Choose the proper type of acoustic sonotrode, according to the required displacement range, which is able to provide proper mechanical stress in the specimen. Note: Each type of sonotrode is designed and calibrated for a different displacement range, thus the proper sonotrode is chosen according to the required displacement amplitude calculated according to section 2. Mount the sonotrode on the piezo-electric converter. Screw the connection screw inside the central hole on the sonotrode until it reaches the bottom. Spread acoustic gel on the face of the sonotrode. Note: A small amount of gel is used, just enough to fill the irregularity of the surfaces, which improves the transfer of the mechanical wave between piezo-electric converter and the sonotrode. Screw the sonotrode into the piezo-electric converter. Run the ultrasonic system with a piezo electric converter with mounted sonotrode to measure the resonance frequency of the particular system at actual temperature. Run the ultrasonic testing software (e.g., Win20k). Choose the type of the used sonotrode in the drop-down menu in the "Model" box. Enter the lowest possible displacement amplitude for the particular sonotrode into the "Amplitude" box. Read the actual resonance frequency of the system in the "Frequency" box. Mount the specimen at the end of the sonotrode. Screw the connection screw into the central hole of the specimen until it reaches the bottom. Screw the specimen to the sonotrode. Run the ultrasonic system with a piezo electric converter with mounted sonotrode and specimen to measure the resonance frequency of the particular system at actual temperature. Run the ultrasonic testing software. Choose the type of sonotrode used in the drop-down menu in the "Model" box. When the resonance frequency of the system with mounted specimen is lower than that without the specimen, reduce the mass of the specimen by cutting off the faces of the specimen's head. Note: If the resonance frequency with a mounted specimen is higher, it would be necessary to reduce the gauge diameter d, which would change the conditions of the test. This is the reason 0.5 mm is added to length of the heads in the manufacturing process. Dismount the specimen from the sonotrode. Mount the specimen into a lathe and turn down 0.1 mm of the face of the first head. Mount the specimen into a lathe and turn down 0.1 mm of the face of the second head. Repeat step 4.6 until the resonance frequency is within tolerance of ± 10 Hz. Apply acoustic gel on the faces to create connections between the sonotrode and the specimen. Spread the acoustic gel on the face of the specimen. Note: Just a small amount of acoustic gel is used to fill in the irregularities on the surface to improve the acoustic wave transfer from the sonotrode to the specimen. If air cooling is used, focus the air stream directly on the middle of the gauge length of the specimen, and wait for about 20 s, so the flow of the air stream saturates the specimen. If water cooling is used, focus the water nozzles at the top head of the specimen, and adjust the stream intensity so the water flows smoothly along the gauge length, to avoid cavitation. Note: Submerging the specimen into water or oil is possible as well, however this can be used only for short time tests due to the significant cavitation effect, which accelerates the fatigue crack initiation process. Open the valve of the air stream and adjust the pressure in the interval between 0.5 and 1 bar. Enter the requested displacement amplitude for the particular sonotrode into the "Amplitude" box. Observe that after the fatigue crack initiation and propagation through a part of the cross section, the system is shifted out of the resonance frequency and the test is naturally terminated. If the test does not end with a fracture, after reaching requested number of loading cycles, (the test is a run-out) terminate using the "Stop" button in the ultrasonic testing software. Screw off the specimen from the ultrasonic sonotrode. Use static loading force to fracture the rest of the cross section with use of a static loading machine. Note: The vector and type of the loading force for the static fracture should correspond with the type of the fatigue loading so that the fracture surface has consistent character. Fatigue test results include loading stress, number of loading cycles, and the test termination character (fracture or run-out) can be seen in Table 1, where results of fatigue life of the 50CrMo4 quenched and tempered steel are provided. The most common interpretation of the fatigue life test results is the so-called S - N plot (S - stress, N - number of cycles), also known as the Wöhler's plot. The dependence of fatigue life on the applied loading stress is plotted in a diagram with historically given inverted axis, where the independent value (loading stress) is on the y axis and the dependent value (number of cycles) is on the x axis. Various types of regression analysis are applied19 on the fatigue life results and, in case a fit is added to the diagram, it is commonly called the S - N curve. However, there was no difference with the original plot, which includes just a data fit. If the test does not end with a fracture, and it is terminated after reaching the required number of loading cycles without damage, this result is called a run-out and in the S-N plot usually marked by arrow. Figure 2 shows a typical S - N plot of three tested steels: Hardox 450, Strenx 700 MC, and S355 J2. In addition, the fracture surfaces of the specimens are analyzed, usually with use of scanning electron microscopy (SEM), where the character of the fatigue crack initiation and propagation is identified and interpreted. Figure 3 shows a fatigue fracture surface after ultrasonic fatigue testing of 50CrMo4 quenched and tempered steel. The crack was initiated on a free surface of the specimen and then propagated through the cross section until the ultrasonic system was shifted out of the resonance frequency (dark area). Consequently, the rest of the cross section was fractured by static loading that created the lighter area on the top of the figure. 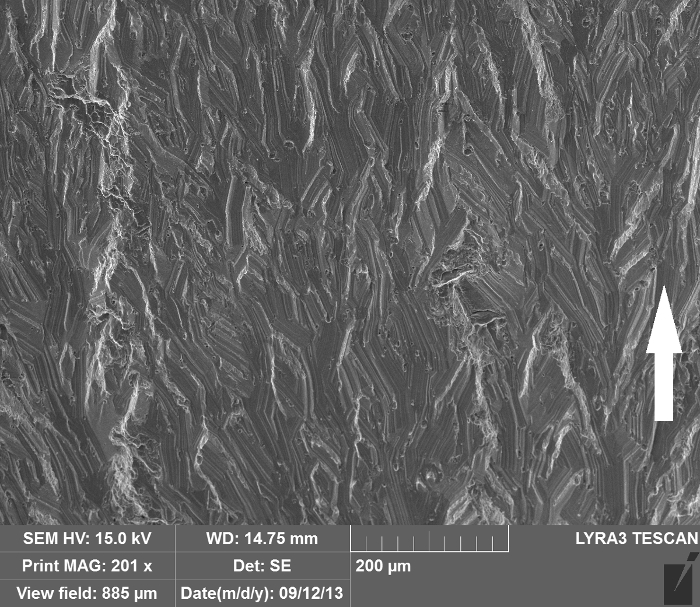 Figure 4 shows the area of the fatigue crack propagation in extruded AW 7075 - T6511 aluminum alloy. Figure 5 shows a cavity created on the surface due to submerging of the specimen into cooling liquid (distilled water with anti-corrosive inhibitor at room temperature) for a long-time test (several hours). The cavity accelerated the fatigue crack initiation and the result of this test cannot be considered as valid. Figure 1: Drawing of the standard tension-compression ultrasonic fatigue test specimen. The dimensions are defined as follows: d - gauge diameter, D - head diameter, r - gauge radius, L - head length, l - gauge length. Please click here to view a larger version of this figure. 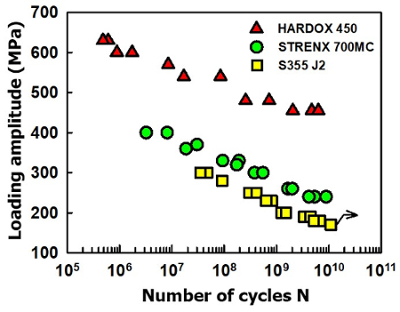 Figure 2: The S - N plot of the Hardox 450, Strenx 700 MC and S355 J2 steel. Run-out test is marked by arrow. Please click here to view a larger version of this figure. Figure 3: Fracture surface character of the 50CrMo4 steel specimen loaded at 365 MPa and fractured after 1.97 × 108 loading cycles. The fracture initiated on the free surface of the specimen. The fracture surface consists of the area of stable fatigue crack propagation (dark area) and the area of the unstable crack propagation, the so called static fracture (light area). Please click here to view a larger version of this figure. 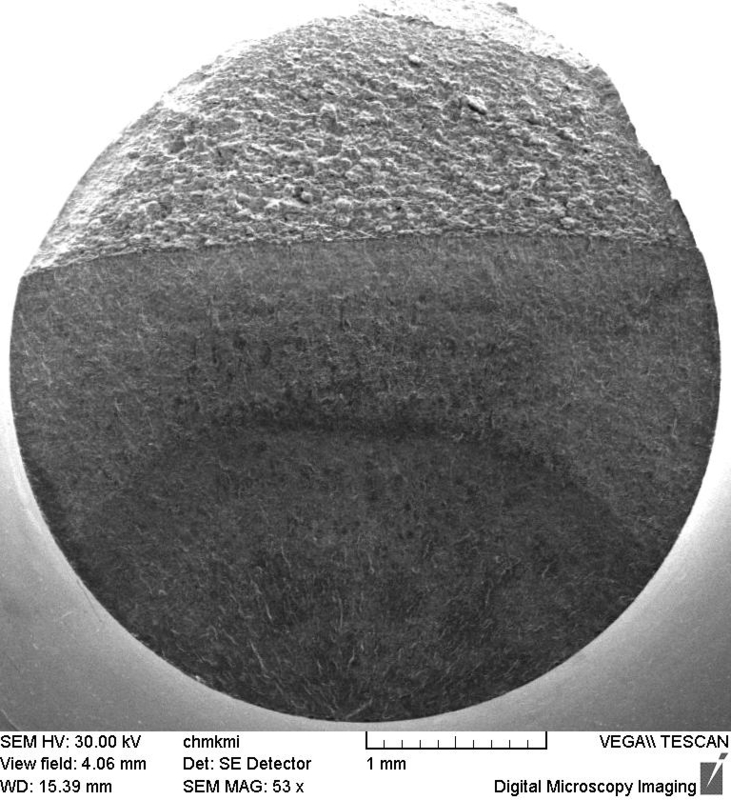 Figure 4: Area of the fatigue crack propagation in the AW 7075 aluminum alloy specimen loaded at 203 MPa and fractured after 8.3 × 106 loading cycles. 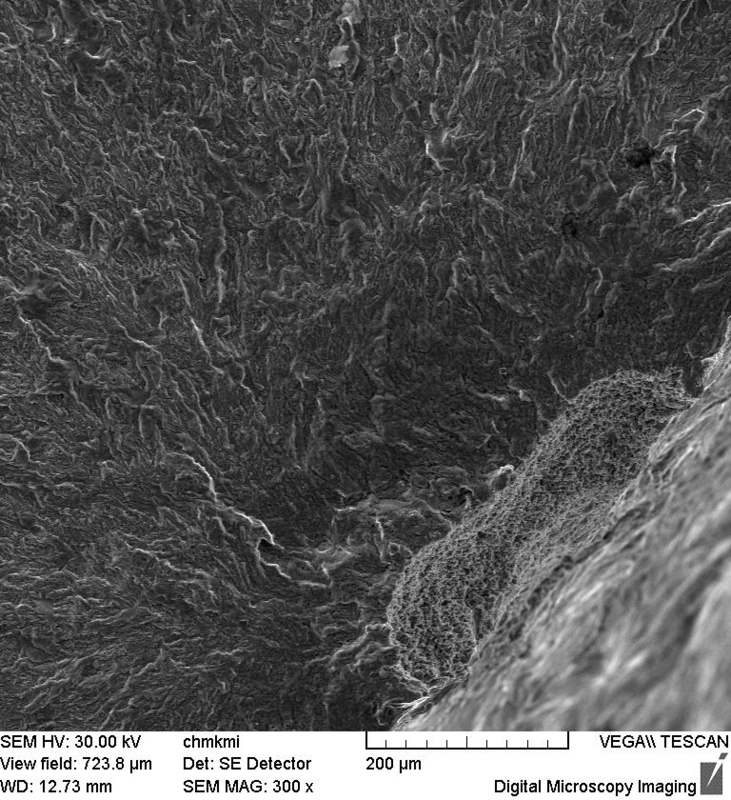 The crack propagated with a transcrystalline fatigue mechanism and the band-kind character of the fracture surface is a result of the strong deformation texture after extrusion of the material in the manufacturing process. The arrow shows the direction of fatigue crack propagation. Please click here to view a larger version of this figure. Figure 5: Cavity on a surface of the 50CrMo4 steel specimen when an improper cooling process was used. The specimen was submerged in the liquid (distilled water with anti-corrosive inhibitor at room temperature). Cavities accelerate the fatigue crack initiation process because they serve as stress concentration notches, thus the result of this fatigue test is not valid. Please click here to view a larger version of this figure. Table 1: Results of the 50CrMo4 steel fatigue life analysis by ultrasonic fatigue testing. Fatigue life results represent the dependence of the number of loading cycles on the applied loading stress. The test can end with fracture, or by a run-out when no fatigue fracture occurs after the requested number of loading cycles. Ultrasonic fatigue testing is one of the few methods which allows testing of the structural materials in the ultra-high cycle region. However, the specimen shape and size are very limited with respect to the resonance frequency. For instance, testing of thin sheets in the mode of axial loading is generally not possible. In addition, testing of large specimens is usually not possible, because the testing machines do not provide such power and it would require the design of a special ultrasonic system. The proper design, calculation, and harmonizing of the specimen should not be underestimated, even when modern ultrasonic generators are able to modulate the ultrasonic wave and successfully resonate a specimen with slightly different dimensions. However, this causes a shift of the node of the ultrasonic wave away from the middle part of the gauge length, and then the specimen is not correctly loaded in the gauge length. For the same reason, great care has to be taken to ensure the symmetry of the test specimen with respect to both axes. A big discussion was held about the correlation of the test results performed at high frequencies with data obtained on conventional testing devices with the low frequency loading. Many tests have shown that results of the high frequency tests fluently extended results obtained at low frequencies, and also some part of the results have overlapped, when the same loading mode was considered10. Later, it was generally understood that the frequency of loading is not the parameter determining the fatigue properties, but the deformation rate is, and large deformations at low frequency of loading provide similar deformation rates as loading with small deformations at high frequency. However, this is the main reason why this technique can be used for tests in the range of high and mainly ultra-high cycle region, where the deformation amplitudes are small. An increase of the operation frequencies of various components made this discussion less important, as well, since this method provides more similar loading conditions than the ones in the high-speed operation. The internal damping ability of the tested material determines the amount of heat produced during the test (internal damping is the ability of material to convert mechanical energy to heat). In the case of insufficient cooling, the gauge length is significantly heated, which accelerates initiation of a fatigue crack due to the lower mechanical properties of the tested material at elevated temperatures. In case of most aluminum and magnesium alloys, a stream of cold air is sufficient to cool down the specimen during the test. For materials with higher internal damping capacity such as steel, nickel, and titanium alloys, a stream of liquid coolant is used. During the cooling with liquid coolant, the cavitation in the middle part of the gauge length has to be avoided, because cavities accelerate initiation of the crack, which may invalidate the test results. Fatigue tests on most of the conventional testing devices end with a complete fracture of the cross section. After the cross section of the specimen is reduced by the continuously growing crack to a so-called "critical cross section", the specimen is then fractured in one cycle and has a character of a static fracture. In the process of ultrasonic testing, when the crack length reaches a critical length which shifts the stiffness of the system out of the resonance frequency, the vibrating stops causing a natural termination of the test. This means that it is not possible to reach the critical cross section and the test does not end with a full fracture, which is later performed artificially. Since the fatigue crack initiation in smooth fatigue specimens (without an artificial notch) represents more than 95% of the number of cycles to fracture, when such a high number of cycles is considered, the difference is considered negligible. Ultrasonic fatigue testing is a very important method, which allows the simulation of conditions of high-speed loading, and reduces testing time. In this protocol, we highlighted the most critical points, possibilities, and limitations of the method for successful applications in material research and safety verification in industrial operation. The work was supported by projects: "Research Centre of University of Žilina - 2nd phase", ITMS 313011D011, Scientific Grant Agency of the Ministry of Education, Science and Sports of the Slovak Republic and Slovak Academy of Sciences, grants No. : 1/0045/17, 1/0951/17 and 1/0123/15 and Slovak Research and Development Agency, grant No. APVV-16-0276. Moore, H. F., Kommers, J. B. The fatigue of metals. McGraw-Hill book company, inc. New York. 321 (1927). Nicholas, T. High Cycle Fatigue: A Mechanics of Materials Perspective. Elsevier Science. (2006). Schijve, J. Fatigue of Structures and Materials. Springer. Netherlands. (2008). Murakami, Y. Metal Fatigue: Effects of Small Defects and Nonmetallic Inclusions. Elsevier Science. (2002). Trsko, L., Bokuvka, O., Novy, F., Guagliano, M. Effect of severe shot peening on ultra-high-cycle fatigue of a low-alloy steel. Mater. Design. 57, 103-113 (2014). Stanzl, T. Fracture mechanisms and fracture mechanics at ultrasonic frequencies. Fatigue. Fract. Eng. M. 22, (7), 567-579 (1999). Bathias, C. There is no infinite fatigue life in metallic materials. Fatigue. Fract. Eng. M. 22, (7), 559-565 (1999). Ritchie, R. O., et al. High-cycle fatigue of Ti-6Al-4V. Fatigue. Fract. Eng. M. 22, (7), 621-631 (1999). Bathias, C., Paris, P. C. Gigacycle Fatigue in Mechanical Practice. CRC Press. (2004). Bokuvka, O., et al. Ultrasonic Fatigue of Materials at Low and High Frequency Loading. 2nd, University of Zilina. Zilina. (2015). Almaraz, G. M. D., et al. Ultrasonic Fatigue Testing on the Polymeric Material PMMA, Used in Odontology Applications. Procedia Structural Integrity. 3, 562-570 (2017). Flore, D., et al. Investigation of the high and very high cycle fatigue behaviour of continuous fibre reinforced plastics by conventional and ultrasonic fatigue testing. Compos. Sci. Technol. 141, 130-136 (2017). Trško, L., et al. Influence of Severe Shot Peening on the Surface State and Ultra-High-Cycle Fatigue Behavior of an AW 7075 Aluminum Alloy. J. Mater. Eng. Perform. 26, (6), 2784-2797 (2017). Mayer, H., et al. Cyclic torsion very high cycle fatigue of VDSiCr spring steel at different load ratios. Int. J. Fatigue. 70, 322-327 (2015). Bathias, C. Piezoelectric fatigue testing machines and devices. Int. J. Fatigue. 28, (11), 1438-1445 (2006). Mayer, H. Ultrasonic torsion and tension-compression fatigue testing: Measuring principles and investigations on 2024-T351 aluminium alloy. Int. J. Fatigue. 28, (11), 1446-1455 (2006). Brugger, C., Palin-Luc, T., Osmond, P., Blanc, M. A new ultrasonic fatigue testing device for biaxial bending in the gigacycle regime. Int. J. Fatigue. 100, Part 2, 619-626 (2017). Wagner, D., Cavalieri, F. J., Bathias, C., Ranc, N. Ultrasonic fatigue tests at high temperature on anaustenitic steel. J. Propul. Power. 1, (1), 29-35 (2012). Kohout, J., Vechet, S. A new function for fatigue curves characterization and its multiple merits. Int. J. Fatigue. 23, (2), 175-183 (2001).